With a new addition to our family due in late June 2016 was always going to be a quieter year for me in terms of races. That said I think I managed to have a decent year although it ended on a disappointing note with me being unable to run the last week of the year, more on that later. 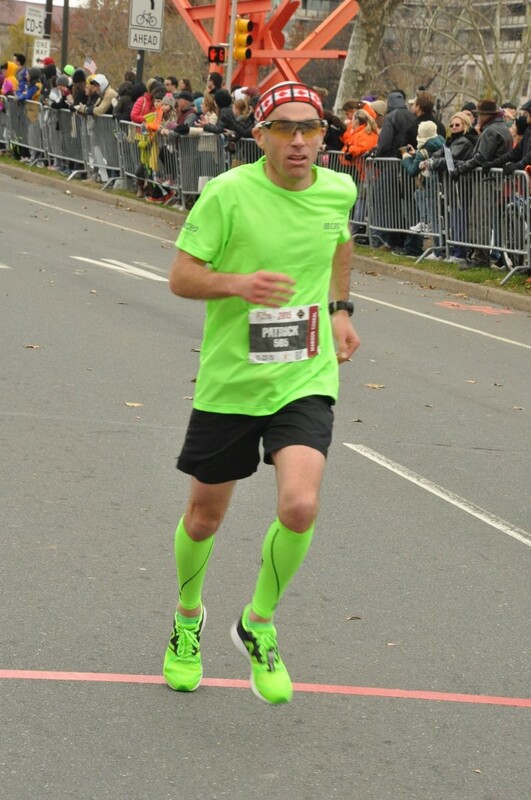 You may recall that I finally qualified for Boston at the 2015 Philadelphia Marathon. However, since I only beat my cutoff time by 2:31 I would have to wait until this September to find out if I would actually get to go. 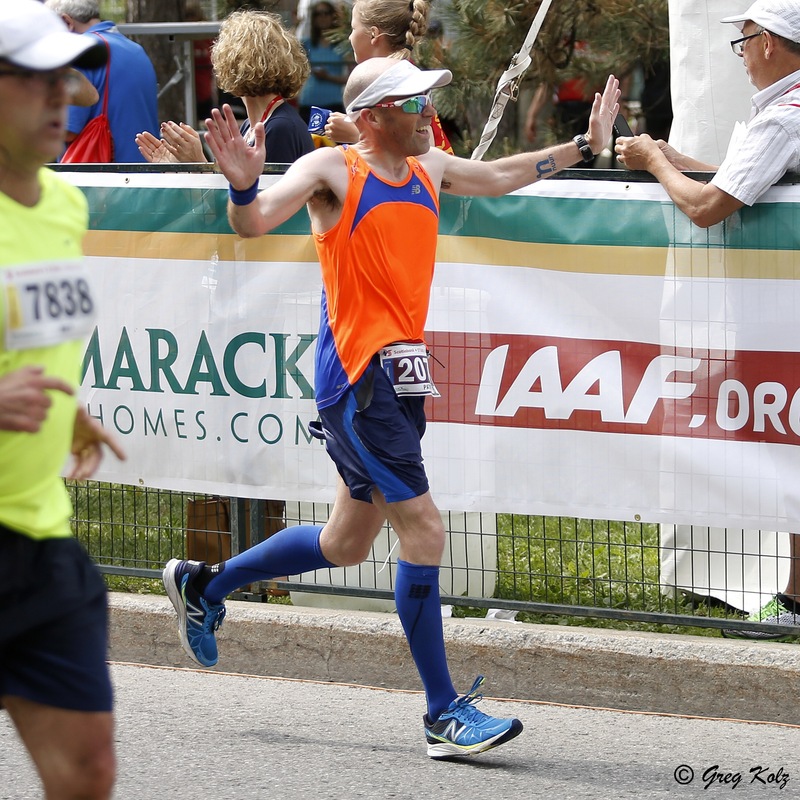 As a result, I planned my usual preparation for May’s Ottawa Marathon with three 10 km races and a half-marathon as part of my marathon preparation. 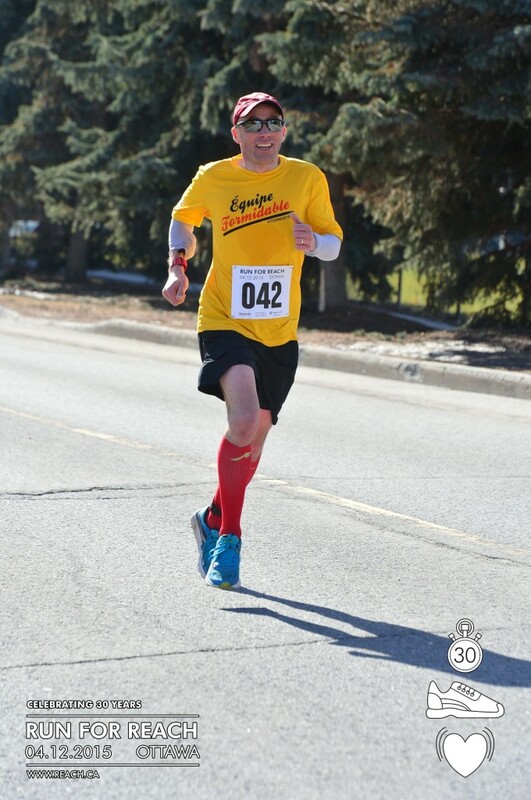 My shorter races went as expected with all of the 10 km times being under 42 minutes (41:06, 41:31 and 41:09). 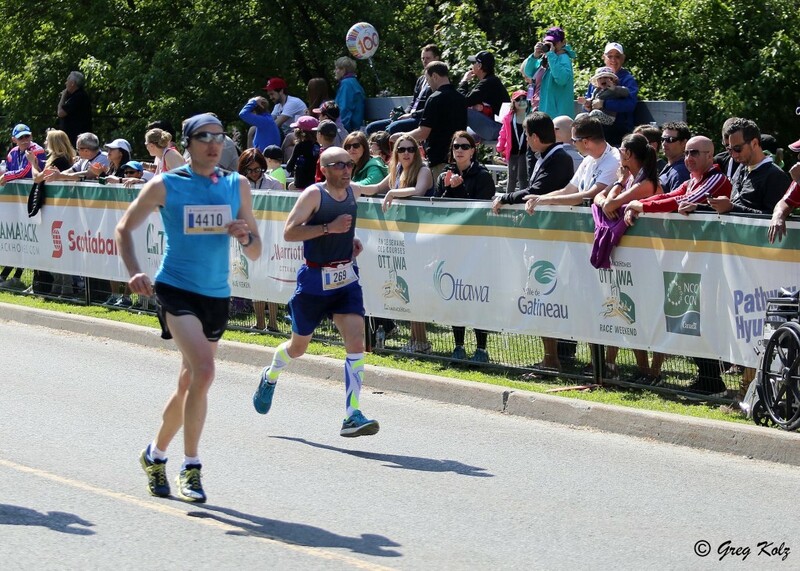 A 1:28 finish gave me my third straight sub 1:30 result in April’s Run for Reach half-marathon. Those times had me satisfied with my preparation for the marathon in May. 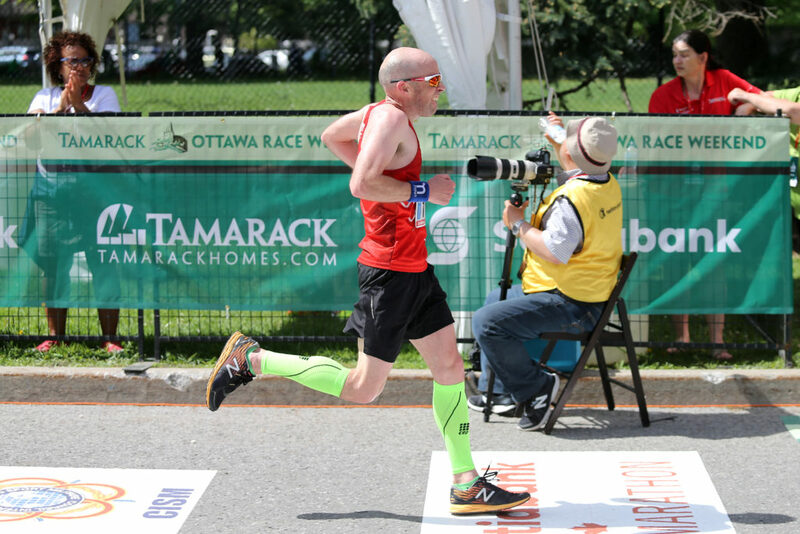 Since I was not guaranteed a spot in Boston with my Philadelphia time my plan for Ottawa was to try and improve my qualifying time (3:15). 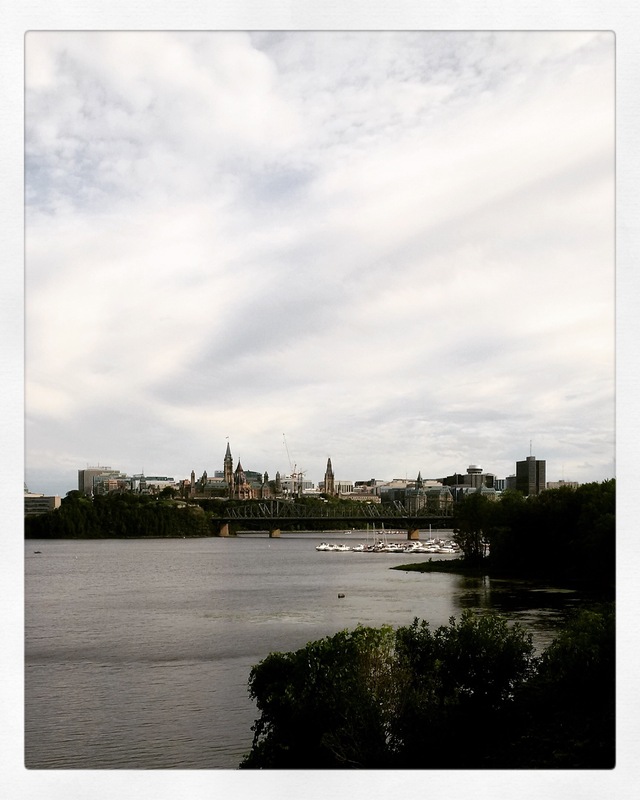 Unfortunately, a heat wave hit Ottawa in the week leading up to Race Weekend. While the conditions for the marathon were better than the conditions for the other races that weekend it was still hot and humid. 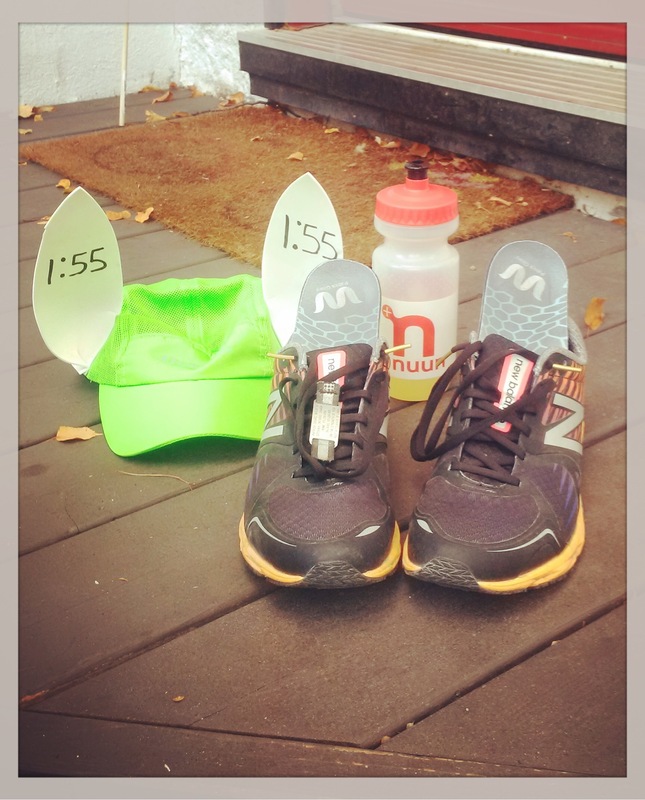 I went out at a 3:15 pace but ended up backing off the pace during the second half and finished in 3:26. The best part of the race was getting to see my two oldest daughters cheering for me right before the finish line. 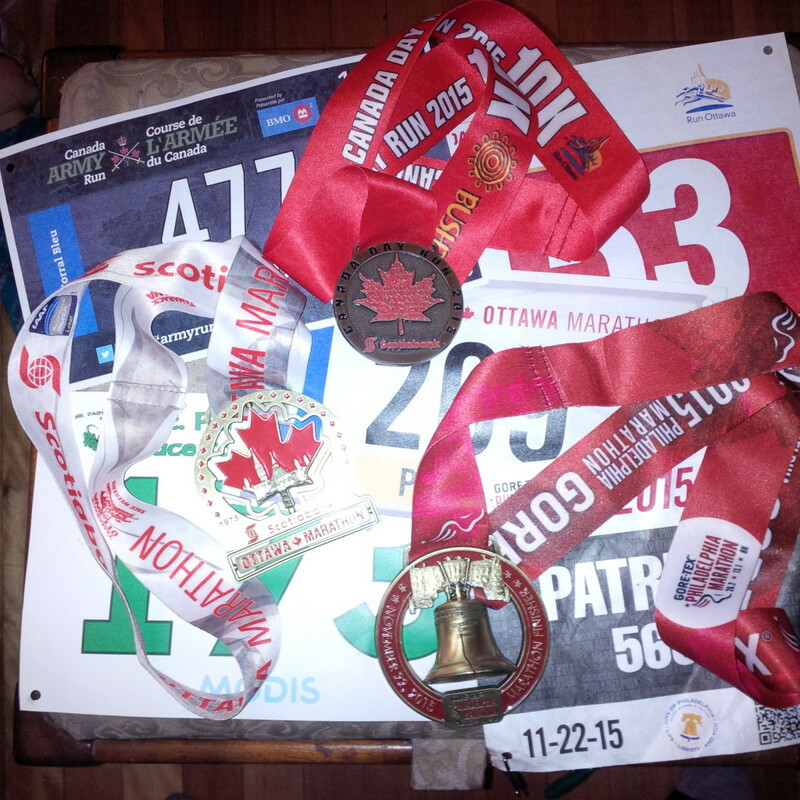 As for not being able to run this past week the short version of the story is that I was on pace for just over 3000 km in 2016 then came down with shingles and had to make an unexpected trip to get a prescription on Christmas Day. I am finally feeling better now and may go for a short run tomorrow to end the year. Despite the past week I have to be pleased with 2016 as far as running goes. 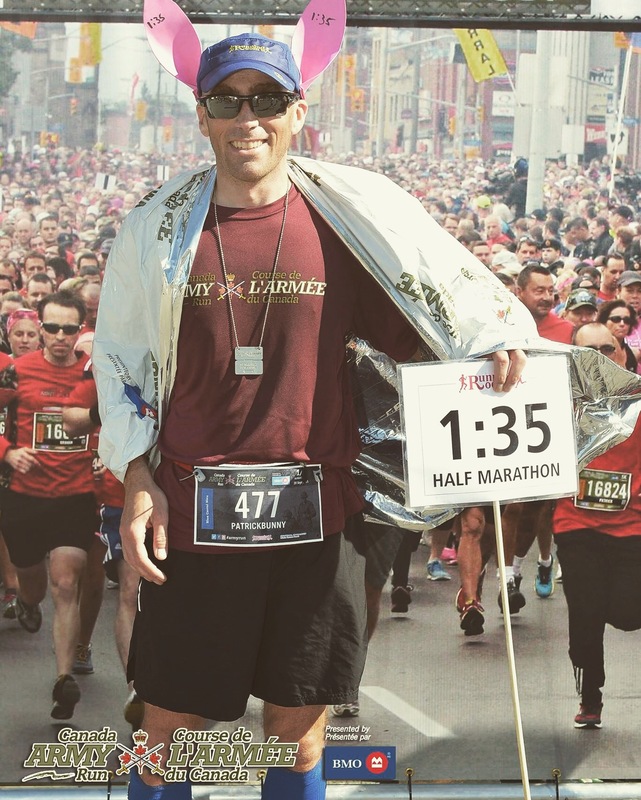 I was healthy enough to run another marathon, successfully paced a half-marathon and had my entry for Boston accepted. I hope your 2016 was also a good one. All the best in 2017! 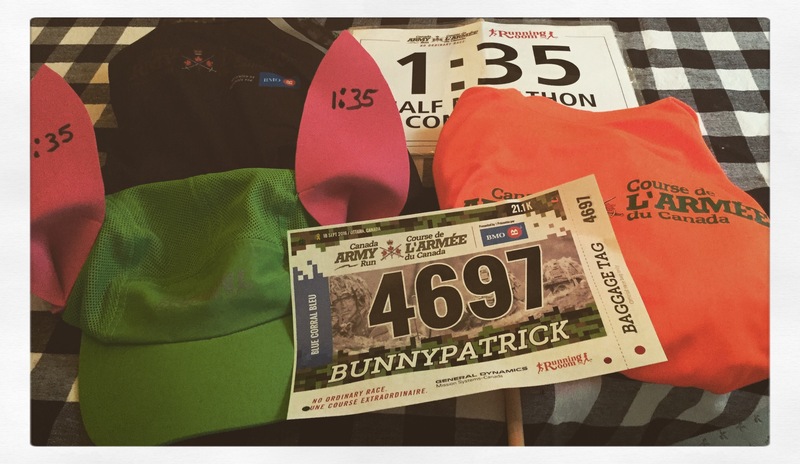 On Sunday I will be running the Army Run half-marathon. 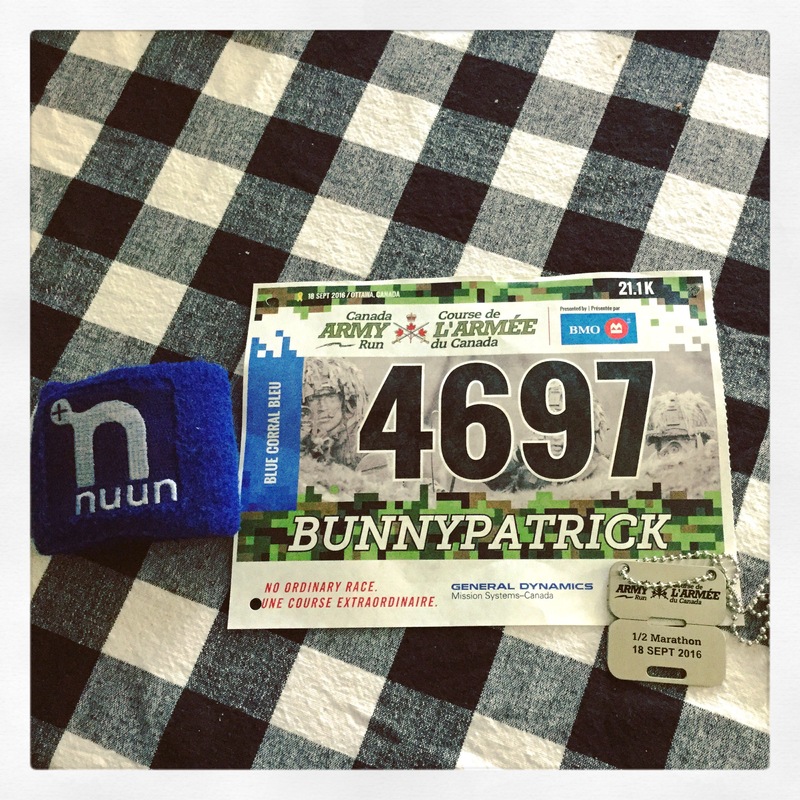 Instead of racing it I will be running as a pace bunny. It has become an annual gig for, I’ve been a pace bunny 6 out of the last 7 years. I missed out in 2012 when I sprained my ankle playing soccer one week before the race. 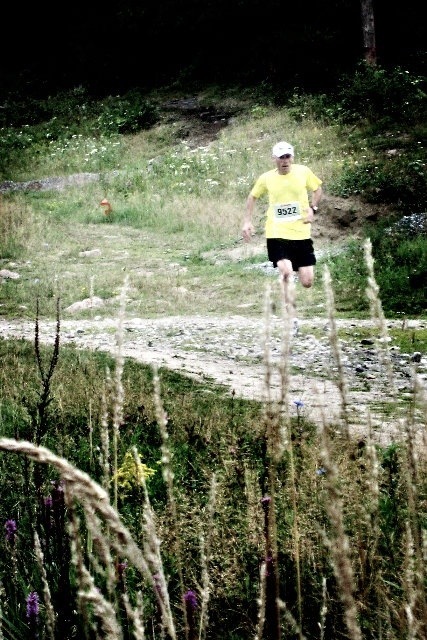 Even if I was not pacing I would make a point of running in the race. 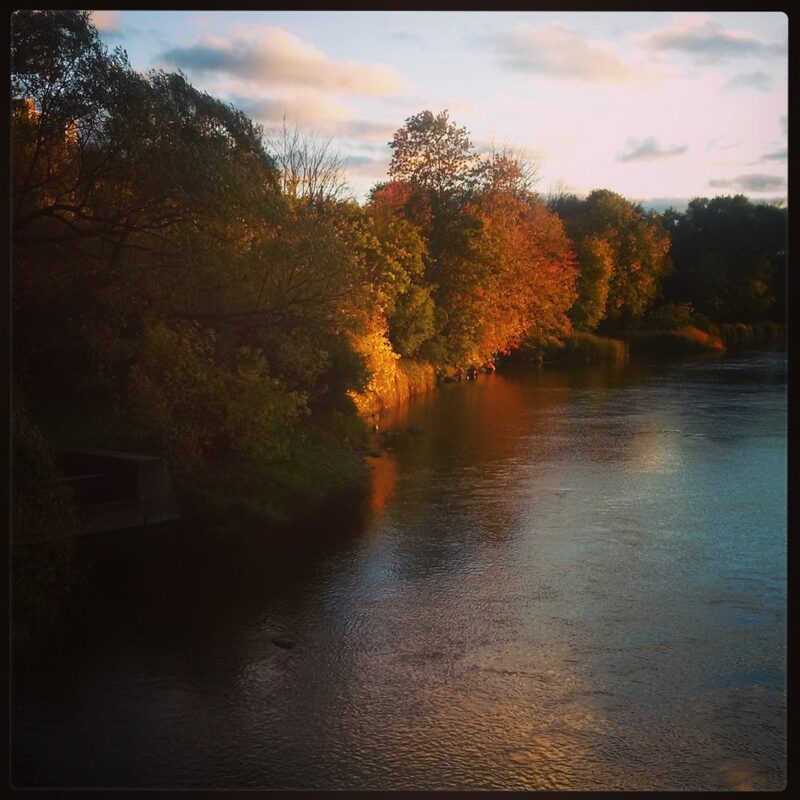 It is the second biggest race of the year here in Ottawa and the biggest option here in the fall. 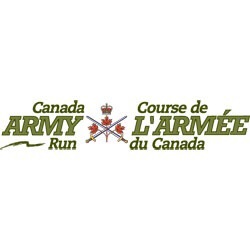 The fact that the race supports the Canadian Army also means something to me since my father was an a medic in the army for 41 years. 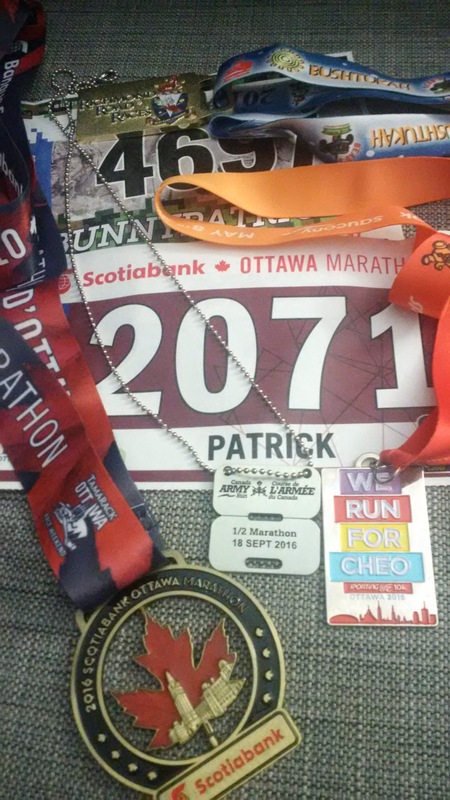 Since I generally find myself racing with a goal in mind at Ottawa Race Weekend in May I have taken a different approach to the Army Run over the last 7 years. Being a pace bunny allows me to have some fun with this race although I still face the challenge of meeting a set time goal. Once again this year I will be one of the 1:35 pacers. Last year the reason for the time assignment was because I was in the process of training for a November marathon with 3:10 as my goal. 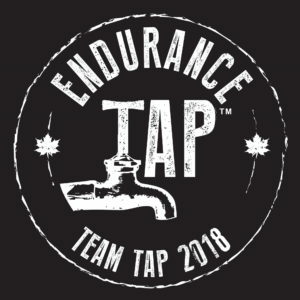 This year I am not running a fall marathon but I wanted to stay at the 1:35 pace because it gave me a goal to keep training for after Race Weekend this year. 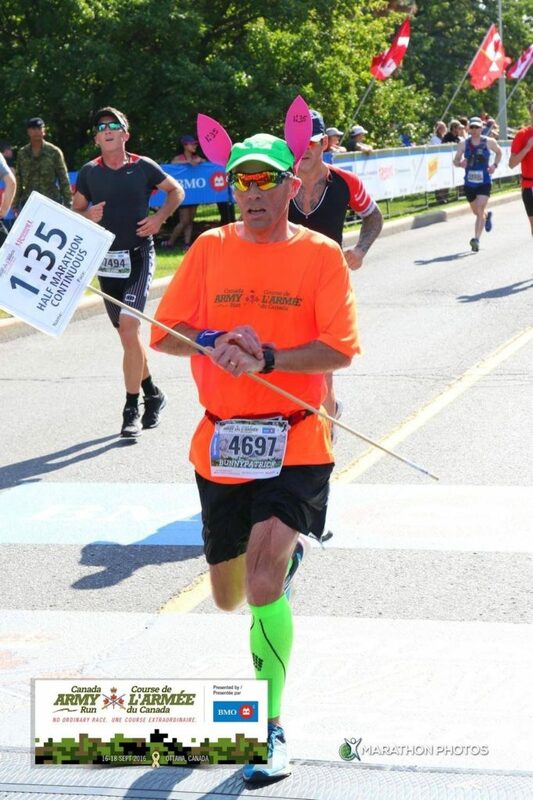 Finally, the last reason I enjoy pacing this event is that my girls always get a kick out of seeing me wearing a hat with pink ears.. I have not been posting on here much lately. It has not been because I did not want to or because I was not running much. In fact I have been fortunate to be able to pick up my mileage and get back into a good routine. I’ve just been finding it harder to find time to post here. My goal now is to get back to regular posts on here. In terms of running, as mentioned, I have settled back into a regular routine of running home from work 4-5 times per week. On the weekends I have returned to doing a longer run on Sundays, some with my 3 year old in the stroller. Over the last month or so I have been averaging 50-70 km per week. The best part to my current running routine is that I am back to running a couple of higher intensity workouts per week. I have done this with tempo runs and speed work on the way home from work and hill repeats during my lunch break at work. In terms of what comes next my next goal race is the Army Run in September. 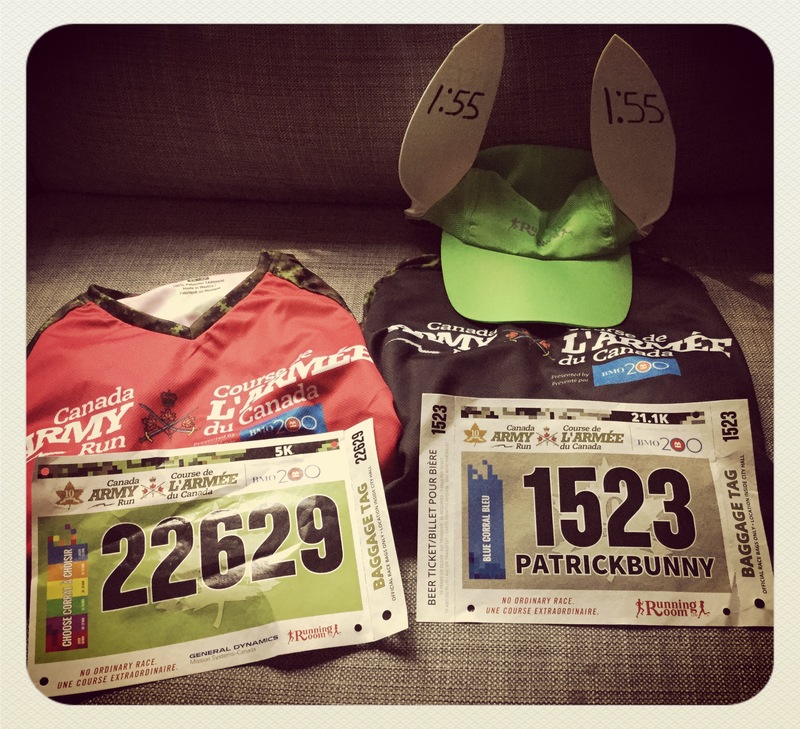 Once again this year I will be serving as a pace bunny for this race. 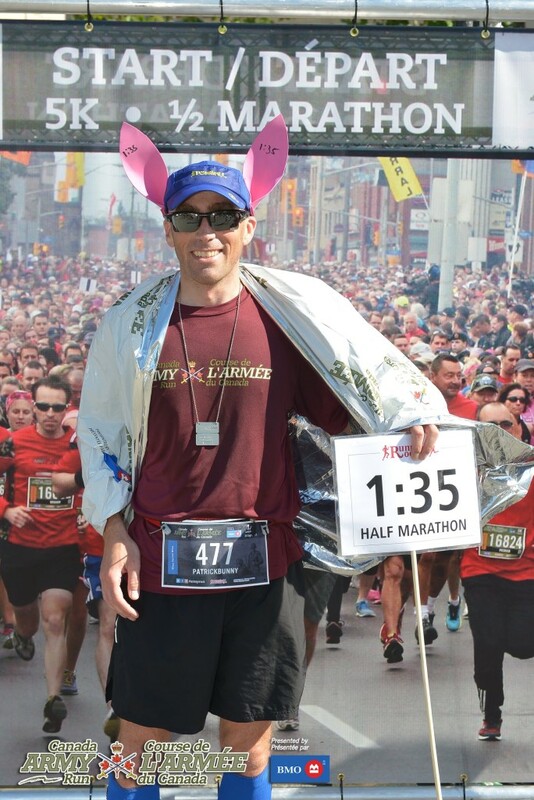 Like last year I will be a 1:35 pace bunny in the half-marathon. 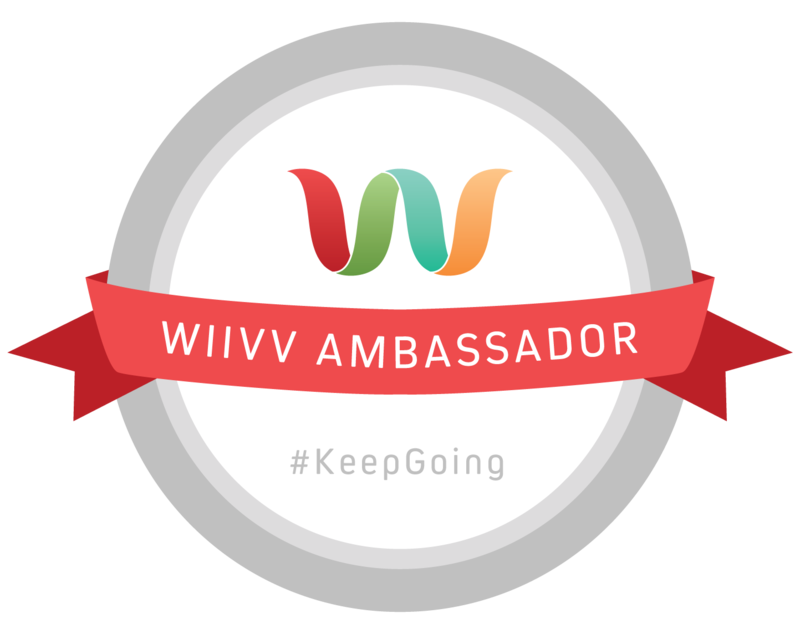 Getting ready for this race has been an incentive for me to ramp up my training again. That is it for my plans for the rest of the year for now. However, this year I do get an added bonus. 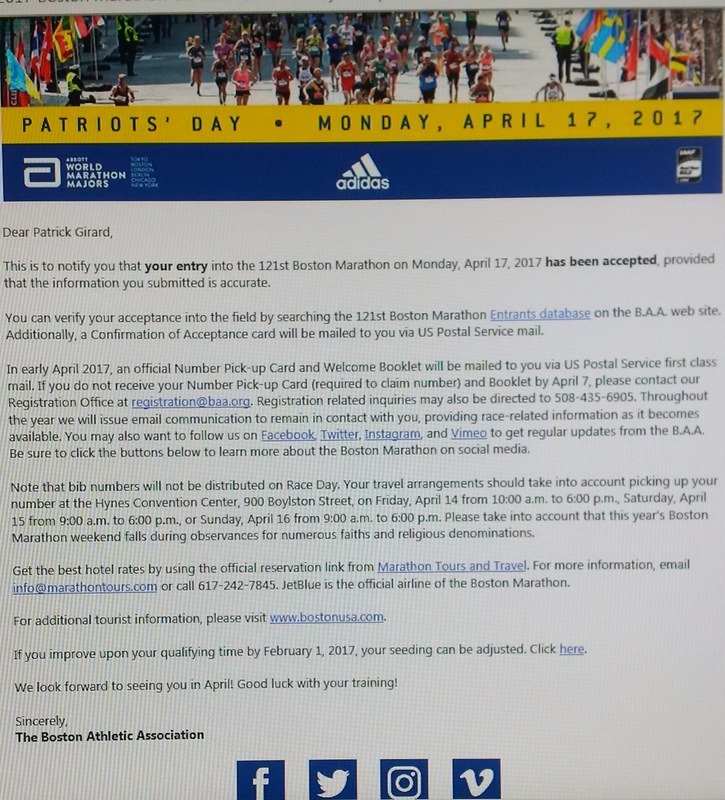 The day after Army Run I get to submit my registration for the 2017 Boston Marathon. 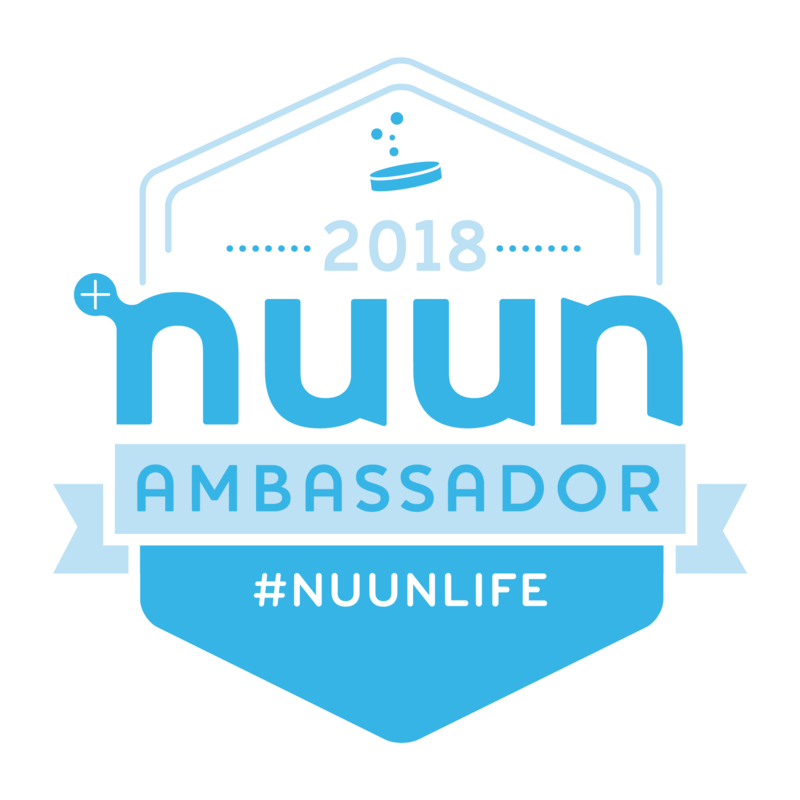 By no means is my acceptance guaranteed since my time in Philadelphia in November was only 2:31 under my qualifying time but it is exciting for me nonetheless since this is the first time I am able to apply for entry.